I recently completed my very first playfield "PF" swap. It was a 1986 Williams High Speed. https://pinside.com/pinball/forum/topic/high-speed-restoration. During my PF swap, I was fortunate enough to make *many* mistakes to learn from. In order to improve my experience for the next PF swap, I thought it would be prudent to document the mishaps, and recommend better courses of action by designing a better plan. This guide is that plan. To prepare for my first PF swap, I got a lot of good coaching from some very experienced people. To honor their time investment, I'd like to pass along many of their good ideas. I'm hoping to inspire a few people who are thinking about doing their first swap to actually take that next step. While there are many Pinsiders who have done many of these PF swaps who could write up a more comprehensive guide, I have never found one, and so I decided to write a complete guide to motivate and support someone doing their first swap. I hope that seeing a complete plan is helpful enough to motivate people who are "on the fence" to finally get started. For people who have already put a plan together for their first swap, they may get a few new ideas, or get good validation for their current plan. For those of you who have done many PF swaps and have pointers to add, feel FREE to add them in the discussion below, and I'll certainly add them back into the fold as I go. If you know of a great resource for PF swaps, please add those references as well. It could not have been possible for me to write this guide were it not for DOZENS of friendly Pinsiders who donated their time and patience in helping me complete my first successful swap. Thanks again! mof last edited this post 2 years ago. mof last edited this post 8 months ago. How much space is required? Can I do this in my kitchen? I am fortunate enough to have a good amount of space to work in. It's tight, but it's enough. Many times during the project I thought of how screwed I would have been, had I not had the space that I currently have (a reminder in case I move.) If you can have your old PF AND your new PF mounted at waist height near each other, you'll have a better experience. You need space to have a BIG monitor attached to a laptop so that you can review your pics. I can't emphasize this enough. I lost dozens of hours searching for photos on my small android device, when I should have had my entire pic deck uploaded to dropbox or other storage, and I should have been reviewing pics on the big screen. This may mean having room for a laptop as well. Nothing cost me more time than not setting this up first. mof last edited this post 3 years ago. You'll need a good set of tools. I have a MINIMUM SET. 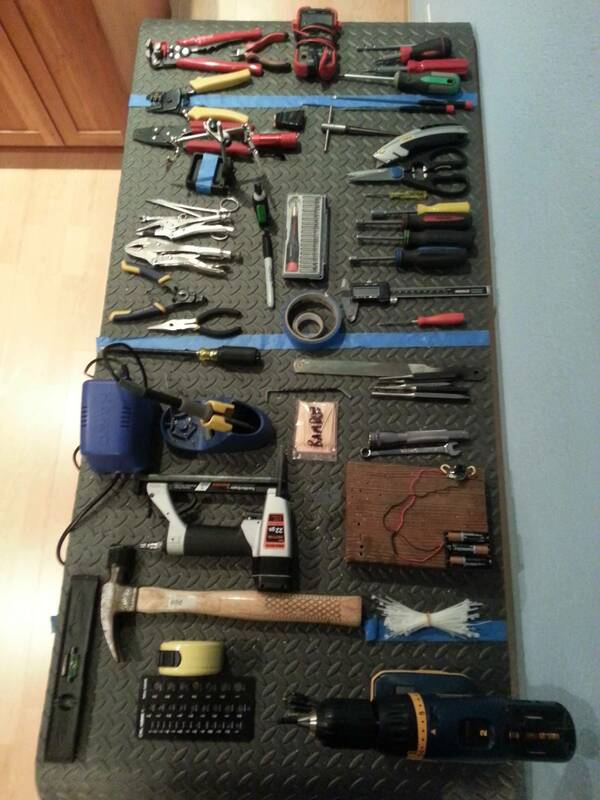 Here's a pic of most of my tool set to give you an idea of what's required. This is your set of 40+ tools you'll need at a minimum to be successful in your PF swap. Don't skip any of these, this is the "minimum set"
* 1/4 magnetic hex driver, best tool of all time? * wire stripping tool, to quickly get a section of insulation off a wire. C. air compressor, to dry off components and drive your staple gun. When you are done with the swap, it may just all work, (with great luck). To give yourself this chance, have EVERYTHING work well before the swap. You owe this to yourself. You'll want to prepare for the swap weeks - to - months before you actually begin it. Here's what I did to prepare before doing the swap (80 hours of work). The reason to do this is, when you are DONE with your swap, you'll have one thing on your mind. "Oh my goodness, I just spent 80 hours on this darn thing, I have got to play it." and so you really don't want another 20 hours of nitpicking details to work on once you are done with the swap. Get it all done ahead of time. Your prep work may be 5-10 hours if your machine is already dialed in, or it may be 80-100 if you just grabbed it from a dirty barn. Another problem with not having a "known quantity" before you start the swap is, if things don't work out after the swap -- you'll want to minimize your troubleshooting. Note: This is the early phase where you remove components and clean, replace, and tumble parts so that when it's time to do your PF swap, you don't have to wait for your tumbler when you are rushing to re-assemble the entire thing... Prepare early! * You'll want to have ALL your tools ready pre-swap. Order them all now. * You'll want to have all your new and old parts ready. If you want to tumble or polish parts, start doing it now, pre-swap. The more you can knock out before you start, the better. * If you have orders to make with online parts vendors, get those knocked out. A few strong recommendations for new parts are: (T-nuts, extra posts, new star posts, etc…) Decide what you want to clean, and clean it. I may like to change up the color of my star posts anyway from Red to Blue or Clear or Violet, depending on the game… There are a lot of them -- what looks like 25 may actually be 45, so count them carefully, and count twice. You'll likely want a new rubber kit. You may want to go to clear silicon over rubber. Decide now. Note: There may be TWO sizes of starposts in your game, so list them out and perhaps confirm them with another owner (just to be safe). This is easily the most important part of preparing for a PF swap. Why? You cannot quit the PF swap. If you do, the pinball gods will hurt you. It will not take as long as you think/hope/pray it will. It will take longer. Mentally prepare yourself for it to take longer and even longer than you expect. I planned for 80 hours, and it took 76 hours. It honestly took MUCH longer than 76 hours, but I decided NOT to count every time I spent 1 hour trying to find a pic I needed. I only counted the ACTUAL work time. Plan for 80 hours for the swap. Allocate much more actual time for this to allocate for research/thinking/cursing/drinking/clean up/calling a coach for help, etc... Bear in mind, I spent 80 hours preparing my game BEFORE I started the actual swap of 76 hours. Patience also means going to bed on time, and not rushing any moves or fixes just because you don't want to wait 7 days for a part to arrive. During your first swap, there will be many situations, where you'll feel like a cornered animal, and all your options are shot, and you may make the biggest mistake of your pinball life. At that moment, decide that you are going to do your BEST job, and IF it's your FIRST one ever -- EXPECT to make mistakes, and APPRECIATE them all. They teach you! In my case, I chose to do a high-production title (High Speed) where I knew if I messed things up good, I wasn't really hurting the pinball world too much, since there are MANY great High Speeds out there to play. I'll be blunt. PF swaps are not for everyone. There really is a "IF I screw this up, I can't easily go back and fix it -- I'd better get this right the first time..." element to it. Those of you who are "all thumbs" already know who you are, and while you excel in other areas in life, you might want to leave the PF swapping to people who are crafty with their hands and have unreal amounts of patience for persevering through sticky situations. If you do have the gift of working well with your hands, and being inventive when things don't go just right, then PF swapping may be a very fun adventure for you. There were countless moments during my swap when I thought, "Holy smokes, this isn't for everyone... I could easily panic and rush this solution and ruin the whole thing... No, I'm gonna slow down and do this right, maybe even ask for help from a few people and make up my mind on a best path, and try again tomorrow..."
There are two phases to tearing down your playfield. Top-side and Bottom-side tear-down. I went with the “leave the top-side in place” method, and started by swapping the bottom-side first. All in all it took about 15 hours to teardown just the bottom side of the game, namely because I took my time molexing all the mechanical components. I will link to sections of my playfield swap so you can see "the big picture" a bit better. I'll summarize the important notes here. Be sure and ask for help if you have any considerations about your back. Doing this allows you to isolate all these components for easy cleaning, tumbling, and adjusting in the future. I remember when I used the hose on the wiring harness, a few screws came loose from the painter's tape. Next time (my plan is), I'll use a plastic zip tie (with a label) and I'll thread the screw through the plastic, holding it in place for each section. This is a really tricky area of the process, so be sure to take notes, and lots of pictures. These are truly "exceptions" to the rest of the work that has a lot of repetition. It's a great feeling to accidentally over-tighten a post, and it snaps off, and you have spares ready and waiting so that you don't miss a beat, and keep on trucking. You are *always* going to find one stripped screw (esp. on a solenoid bracket) -- keep your stock up on common parts. Note: if you have an old solid state game where the GI braid is soldered directly onto the sockets, you may want to consider upgrading the sockets and/or finding alternate paths for attaching the sockets to the GI braid. 3. If you have a Bally with #555 sockets, you may want to upgrade them to #44s. Add two layers of varnish to the bottom side of your playfield (if it's got an unfinished underside). You'll be glad you did. 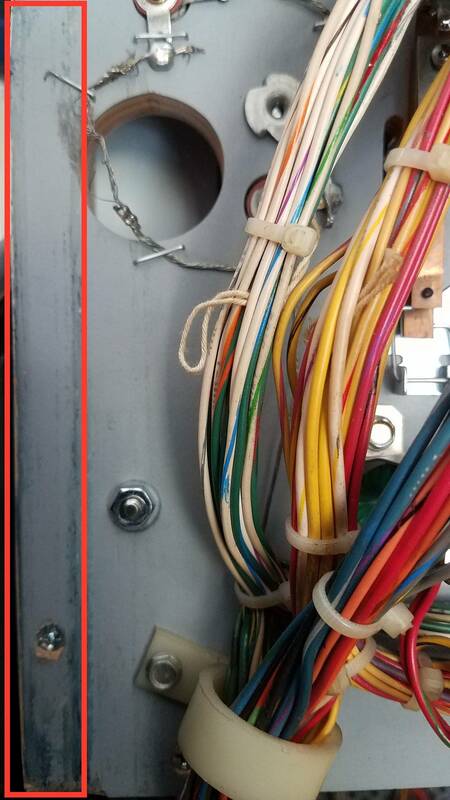 You have two options for removing hardware: cut your wires 1/2" from the lugs on all solenoids and save the "color coding" stripes, OR, add molex connectors. I have tried both styles, and my favorite is by far molexing. Once you get good at molexing it can be done rather quickly. The advantage to molexing is that in the future if you wish to clean or service a component you can easily remove it within a minute, and leave your soldering iron on the bench. In cases b. and c., you'll need to prepare much more than for case a. You'll need great reference material to make this a smooth process. There are a few sites on the internet with 100's of pics to review. There are Pinsiders who will share their reference pic decks with you. The question to ask is, "How will I continue if I get stuck?" when you don't have an example nearby to reference? It is important to have a great set of pics. I also like having a few movies, that allow me to see things from different angles. I will scan from one end of the playfield to the other VERY slowly. (Go slower than you think you need to go, and then go slower than that.) If you don't have access to a deck of pics, then you might not want to start until you have this secured. For case a., where you get to have your old PF nearby while you work, then you still want the movies and pics, but if you run into trouble, you'll have the luxury of walking over and taking measurements, using wax paper templates, and working directly with "good working evidence" to double check your ideas on how to proceed. If you are not already, you will become a drill-master by the time you are finished with your first playfield swap. You will be making many new holes, and likely moving a few holes, which means filling a few holes. Grab a nice piece of scrap wood, and get to practicing. Take your electrical tape and make bit stops about 1/2" from the end of the bit. Measure your playfield and get a sense of what your MAX distance should be. In general, your goal is to clear material so that 6 - 1/2" hex screws will thread nicely. Now decide you want to move the hole the width of the bit to the right. This means you'll have 1 wall that is a tad weak. To strengthen the wall? Fill the old hole first. Add a few drops of super glue, an let it dry a few minutes. Add a few more. Wait a few minutes. Now, start filling the hole with bamboo toothpicks. Take your wire cutters, and clip the toothpicks flush with the playfield. Grab a punch that's smaller than the hole diameter, and tap to ensure your hole is well packed and tight. From here you can grab a little wood putty and cover the hole, or continue with a touch more super glue. Once it dries, drill your second hole RIGHT next to this one, and drive in a screw. Notice the integrity of the new hole. Did you do a great job? If you are lucky enough to be upgrading from an old playfield to a new Repro PF, then you have a template of "holes that work" and you'll want to use these as your guide. Specifically, when two components work together in tandem, such as a solenoid assembly AND an arm locked into the playfield, then you really want to maintain the integrity of that relationship and keep those two mechanisms situated the same distance and angle apart from each other. Use a piece of wax paper from your kitchen, and a sharpie, and make a few marks on your old playfield including the set of holes from both contraptions, and use that to help you make decisions on your new PF. As you may have noticed, it is rarely necessary to use all of the holes possible (with hex screws) when mounting a component. This is especially important to keep in mind when attaching a new component. Feel free to start with 1 hole and 1 hole only, and mount it that way, until you play test the machine. In some cases you may have extreme confidence that you have a part in the "perfect" spot, and you'll want to drill all 4 or 8 holes and just mount it. That's fine. In some cases, especially where a switch or level is involved that you have doubts about, start with 1. Play test, and then add all the remaining holes later. The downside to that is the sawdust that will go everywhere when drilling into a PF that already have components all over it. One workaround, is to drill where you think things will be happy, and simply DON'T screw in everything until you play-test, and then when you have confidence after 20-30-40 plays that everything is in the right spot, you can screw everything in. I don't have the "perfect" answers here, my best advice is to give yourself permission to work in stages as you build confidence on the perfect positioning for components, and trust that the newer high quality hard woods that Repro PF manufacturers choose can truly hold in a component WELL with only 1 screw. I wouldn't have that trust with the original playfields -- usually that wood is much softer with fewer layers. There are several ways to damage your playfield, and give yourself heartache and stress: You can scratch your clear coat, you can fracture your clear coat, and you can flex/stress your playfield. Make a decision right now to NEVER lay anything down on your playfield. have a nice towel that you can fold over and protect your playfield with if you need to lay anything down on top of it. You didn’t just do 80 hours or work to put a nice scratch in your playfield. Another way to scratch your playfield is to allow a tool to skate across a surface (such as a drill bit, without a good starter hole) — or to have a tool skate across because you were applying too much force. Another way of course, is to hammer and miss. Make a commitment up front to baby your new playfield, and be VERY conscious of the force you apply to a tool, and always ensure that if you are screwing something with force, be very mindful of how you can minimize the chance of something slipping and hitting the PF. If this idea is a struggle for you, you can always take a 10 minute break, and grab a piece of scrap material from the garage, and cut something that can act as a protective piece while you are working. There are various DIY tools you can build to protect your PF from possible damage, but I wouldn't rely on them as your sole defense. Your number one goal should be to be VERY mindful to apply the minimum force necessary in whatever you are doing, and keep your mind in the present moment while working, and not think about anything other than considering, "Am I being as careful as possible in this moment?" If you do end up scratching your clear coat, relax... there are other threads that can train you to repair them. I’m speaking to the clear coat that surrounds each and every hole. Treat each of these areas with extra care. This is where a very special tool, a “tapered reamer” comes into play. It has the ability to very carefully remove tiny amounts of clear without any concern of shredding an area you might harm from using a power tool. Start by making a hole in your piece of scrap wood, then use your tapered reamer to enlarge to top edge of the hole. Notice that you can apply quite a bit of force to the reamer. It’s important that you always consider how much weight you put on the playfield while it has no wood rails attached. This means you won't be laying any heavy power tools on either side of your PF while working to minimize risk to flexing it. It’s also important to try to get all your hammering out of the way before you build up any structures. I’ll recap this in “timing” but you’ll want to get your ball guide wire forms, and your pop bumper nails in place early. If you have a particularly component heavy game especially in the middle section, I suppose you could install your wood rails early, to ease this concern. I'm not a fan of installing woodrails early, since I like to use clamps at times to hold up my playfield, and woodrails take away your edges to clamp down onto. The topside is the easiest, and the most "in the way" once installed, so I'd recommend doing it last. If you search Pinside you will find there are many methods to clean your wiring harness. I chose to douse mine with mean green, hose it off, use an air compressor to get it mostly dry, and then bake it in the oven at <250 or so for 30 minutes until very dry. If you remove most of the zip ties before doing this, you'll have a much cleaner outcome. When you put the wiring harness back on, you may notice that it doesn't quite stretch and reach the way it once did. This means, I'd recommend installing the white plastic wire guides LAST since you really don't know where you'll want them UNTIL you have the harness in just the right place overall. You may want to cut many zip ties to really allow you to get your harness clean. It's fun to re-attach a hundred or so, and really get all the wires tight and where you want them. There are other benefits of having FEW zip ties installed while reattaching the wiring harness -- it gives you a lot more flexibility. One thing to know when assembling your playfield is that there are a few parts that like to escape like Houdini: E-clips and Solenoid springs. When you know you are going to be installing either of these components, I have a secret for you. Turn the music off. Use your ears to help you know “where” the part escaped to if either of these components jumps to escape its life in "the machine." The sound of the clicks as the item bounces away will help you find it a lot quicker. Another tip along these lines is to keep your workspace CLEAN. If/when you drop something, it will be much easier to find things if your space is already swept and picked up daily. One thing to bear in mind when driving in a screw is to mind your screw lengths. Never drive a screw from the bottom-side up through the top-side and create a new hole. This sounds easy and logical in principle, but there are a few strange situations where it's easier to do than you'd think. Each component has a various thickness to it. Thicker components like a flipper bracket assembly can take a longer hex screw, and then a thinner component like a lamp socket, might need a shorter screw. You may have a section of your PF that is routed to make room for a ramp, and that means less material, and you'll need a shorter screw for that section. Pay special attention to your playfield and what screws are used where. Be on the lookout for the "oddball" screw lengths. There are many options here for keeping track. Some will keep a journal with notes and ziplock baggie off all their screws in small batches. Others will throw ALL screws into one big pile since they pretty much know what component uses what. I think that's fine for 90% of the screws, so it's critical that whenever you come across a screw that is shorter or longer than expected, I'd stop and take a photo of that spot. I'd also find a way to bind that screw to that component. I'm wondering if we can use zip ties with the little labels on there, and actually drive a screw through the plastic. I'll try it when I get home. This could be a neat way to keep track. When your project is 99% complete, you’ll want to run a few tests before plugging in various “dreadlocks” one by one with the power on. I started by doing my own GI Braid checks. I took my light bulb checker, and ran a line with some clips to my GI braid and powered my bulbs with 4.5 VDC. When it comes time to put the playfield back in the cabinet and test, consider going one at a time. Get to know your “dreadlocks”. On my High Speed, I had four: (1. GI braid 2. controlled lamps 3. Switches 4. Solenoids + Other)… Plug these in one by one and test in switch, lamp, solenoid mode, etc… If everything checks out, say a prayer, and fire up a game. When I did my first swap, I had errors in all tests, and I had to iron things out one by one. A few hours later, I played my first game. No fuses blew. mof last edited this post 10 months ago. Ummm wow, can't wait to digest all this info. Nice. Please let me know if anything is missing or needs clarification. Thanks, you have a GREAT problem on your hands with those three great titles. I'mma scared poppa. I got three of these to do. My first three. When you say you're 'a scared poppa,' are you suggesting that you have a few concerns about getting started? Did two in under two weeks last month.. once you do the first one, the subsequent ones are far less scary. I know his feeling of trepidation well. I have a Silverball Mania and a Flash Gordon to do swaps on. It just seems like a daunting task when you are staring at the beautiful new playfield next to the beat up one still in the game. once you do the first one, the subsequent ones are far less scary. I put off my first PF swap for 6 months until I felt I had all the "know-how" pieces lined up AND a big block of time. The truth is that you'll never be 100% prepared, you can only do your best. Imagine that doing a playfield swap is a journey of ... 200 steps. Every step counts, and there are no shortcuts (other than outsourcing...) Even preparing to be prepared is a step. Take the next step, and if you get stuck, ask for help. I am going to start with Silverball Mania first. It has far less going on than Flash Gordon does. I am thinking about having both of the playfields sent out to be clear coated first though. They are both CPR reproductions but there are some defects in the clear coat. I'm going to open up a new thread to request people link their "favorite" playfield swap videos and Pinside playfield swap threads, and I'll do my best to put together a summary post with every link you find in there. I want to make this playfield swap guide as helpful as possible. Awesome info. Thanks for sharing your experience. Added a very important section, "Screw Lengths"
First of all, thanks for doing the work to put this guide together. I could have used this info way back when. Excellent way of organizing the information, too. I think molexing assemblies is nice but in the long run probably overkill. IIRC, in 26 playfield swaps I have had to repair one assembly after the swap, and that was a drop target coil so I had to desolder it anyway. This is over a 12 year period. There just aren't a whole lot of things that have to be reworked again to the point of removing an assembly. Most people just don't put enough plays on a game in home use to wear anything out. If you like working on connectors, there will be plenty of other original connectors that will need to be repinned during the playfield swap, you can be sure of that. To me, this additional step just seems like a personal preference, time available thing. One more thought, don't forget that each new connection creates a possible failure point. So I guess you could refer to "Molexing" major components under the playfield as a personal preference. Some playfields can be pretty daunting. It is amazing how much hardware you can remove in an organized manner by using Molex connections. I personally don't like to de-solder coils and then try to keep track of the wiring...or leave them attached the harness to drag to the new playfield. I do this with all playfield swaps. I did 2 of those, BK and Centaur. Toughest swaps I've ever done. Nicely done, I'll be tackling my first full on PF swap on a Bad Cats later this summer. I use a slightly different approach. Many problems in games turn out to be broken wires. If you look closely at the solder points, you'll often see frayed wires. For this reason, I cut every wire off of every coil, and on older games like Centaur, off of every lamp socket. I cut them close to the device so as not to shorten the harness any more than necessary. All screws go into the same bucket. Nothing is labeled. Teardown takes two hours or less. All parts are cleaned and rebuilt the usual way; tumbler, buffer, replace worn parts, etc. I use the manual to help me with reassembly while I solder everything back together. I like to sort the screws into muffin baking tins so that I'm not rooting around looking for the correct screw. This method might not be for everyone. I've been working on pins for almost 30 years, so I have learned the general methods the factories used. For example, mechanisms get a 1/2" screw, while lamp sockets get a 3/8" one. One big benefit is that you're not relying on the previous technicians to have used the correct parts and fasteners; you're building the game from scratch. You also learn how to read schematics better, since you're forced to. Lots of time saved not bagging and labeling components. I still take lots and lots of pictures. Again, not meaning to step on toes, just giving a different perspective. Many problems in games turn out to be broken wires. If you look closely at the solder points, you'll often see frayed wires. For this reason, I cut every wire off of every coil, and on older games like Centaur, off of every lamp socket. That's a great inspection tip -- I actually *do* find one bad (or almost-bad) wire on most 80's pins I pick up. I'll add that to my master shop job checklist. I use a slightly different approach. Many problems in games turn out to be broken wires. I'm starting my second swap. Williams Sorcerer. Thanks for the great advice... Caught me a frayed wire! Note: may need to add: ensure ALL holes are present as expected topside. If not, get out your dremel, drill, and reamer and start making holes. Note: Lay down a second coat of wax when done with the holes. Note: smooth bottom edges of stainless steel ball guides w/ emery cloth. Note: consider reaming BOTTOM-side holes for ball wire guides -- they lifted some wood when hammering, and that surprised me a lot. OH man, favorited. I just ordered a repro pf for my getaway, and this will be my first attempt at such a major pin undertaking. Thanks for the documentation! This thread was invaluable for me in doing my first swap. I am about 85% done, have not done the top side yet, but starting that today. And hopefully finishing! I’ve cleaned and polished every mech, topside and under. Will be waxing the top this afternoon! Nice job mof. Thanks for sharing. terryb -- Thanks for all your help over the years. Biggest problem I had with my F-14 swap was that the holes are not all going to line up exactly like before. Several times I had to epoxy fill the original hole and re drill to get mechs positioned properly. This caused some frustration, especially with the pop bumper switch stack. I used my ipad for pictures. It worked great and is portable unlike a large monitor. Also, I recommend replacing all crappy looking light sockets now while it is easy. Especially the flush mount staple down type. Hell, if I had it to do over, I would change all light sockets. It's worth it if you are changing out the playfield.